My typical morning breakfast of choice is Greek yogurt or oatmeal. I recently found Muesli Fusion and became interested. They make different muesli mixes which sounded good for breakfast. I decided to take a bag of the classic Swiss muesli and toast it in the oven. I decided to use this bag as cereal to toss over my Greek yogurt. I toasted it in the oven for about 15 minutes or so until it was golden brown. It turned out really good and gave that flavorful toasted taste that I enjoy. These products contain many good-for-you ingredients including oats, Organic Raisins, Organic Chopped Almonds, Organic Cranberries (organic cranberries, organic cane sugar, organic sunflower oil), Organic Golden Flaxseed, Organic Dates in Organic Oat Flour and Organic Whole Grain Rolled Rye. They do not have any unknown ingredients that people do not know what they are. These cereals can be oaten cold with milk or heated. I tried the athlete fuel muesli cooked like oatmeal and loved it. The almonds, raisins and cashews were tasty among the hot oats. 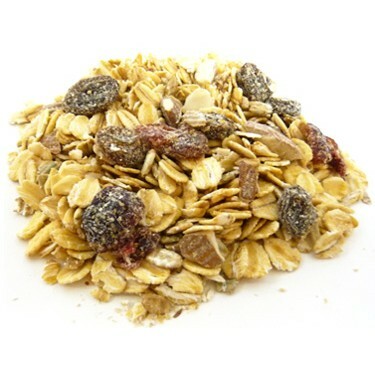 These Muesli Fusion products contain real, organic ingredients that are a perfect breakfast or snack option.